Target is discontinuing sales of all Amazon Kindle e-Readers and the Kindle Fire by May 13 2012. The company has already suspended all online listings for Amazon devices. 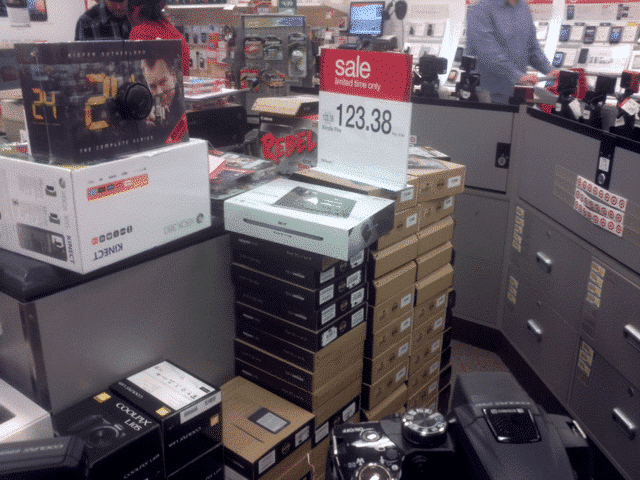 The Kindle Fire accounts for most of Target’s sales in the tablet department, which sold out nationwide on Black Friday 2011. The reason why they are not selling them anymore? A conflict of interest with Apple. Apple apparently has made Target an offer to provide all their new projects and devices at a better rate if the retail chain plays nice. Target does not make much of a markup selling Amazon e-readers and tablets. The allure of “all things Apple” is a siren call that is hard to resist. Many Target locations have Kindles in stock right now, but will be no longer ordering any and will remove them from all retail stores by May 13th. You can expect some massive deals to be had in the next few weeks leading up to the cutoff. Internal documents suggest the company is going to have a firesale leading up to Mothers Day. With a deep enough discount, I might pick up a Kindle Touch.